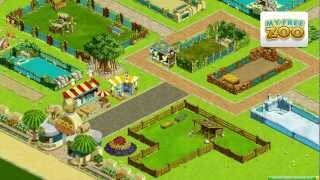 My Free Zoo - register and play! People like to visit zoos because there you can admire animals from different parts of the world. And even though some animals live in our area, they don’t run around the streets, and therefore it’s interesting for kids to see horses and pigs not in the picture, but live. In addition, the zoo is a place of entertainment, where you can ride on the carousel, sit on a bench and eat ice cream and cotton candy. This is a great place for a family holiday, which will be remembered and will leave a pleasant mark on a child’s soul. 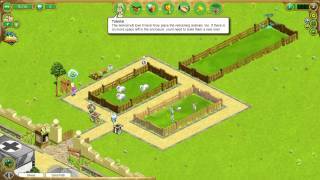 But not always parents have time to go there, and not all cities have a zoo, but the game My Free Zoo takes the responsibility to acquaint players with the diversity of animals and give the opportunity to build the menagerie of their dreams. Remember what you lacked during the walk between the enclosures, and try to correct the mistake of the administration in your establishment. When you will play My Free Zoo, the gray-haired zoologist professor (who is also the director) will direct your actions, give advice, suggest the right decision, help you learn the fun menu. Listen to an experienced mentor, and your zoo will become famous throughout the virtual world. After the end of the simple My Free Zoo registration in this browser game, you will meet the director, Mr. Baranov, to start a close collaboration. He asks you for help in saving the zoo, which they intend to close for the lack of animals and useful buildings. Apparently, the director was so carried away by his scientific work that he completely launched such a wonderful place. Or there is no commercial vein in it at all, but you will fix it. This is not all representatives of the animal world, but My Free Zoo iPlayer itself will gradually open access to new instances to you. Finding a place for the location of the aviary, consider the relationship of pets in nature. It is better not to place predators near their potential prey, so as not to provoke a hunt. Hungry and dirty little animals interest nobody, and if you don’t play with them, they will get bored and stop entertaining visitors. If people do not like it in your zoo, they will not return, and will not advise it to their friends. Since your income depends on the number of visitors, you just have to offer as much interesting things as possible. B shop buy beds, benches, fountains, plants, cover for paths, lawns, points for the sale of balls, ice cream and other goodies, and arrange them where there is a lot of people that the revenue from sales was higher. There is also an assortment of drinkers and feeders for animals: meat eaters and herbivores. Acting deliberately, you will expand the zoo, populating it with strange inhabitants, turn it into a profitable place and attractive for recreation.